Since I've been on a bit of a fitness kick lately, I've had the most insane cravings for chocolate, so earlier this week there was only one thing that I could do - make a chocolate cake of course! This one's vegan-friendly, dairy and refined sugar-free, but this is no low-fat version as it's still seriously rich and utterly decadent. Out of all of the cookbooks that I own (and I own quite a lot), the Deliciously Ella books are the ones that I keep going back to again and again. 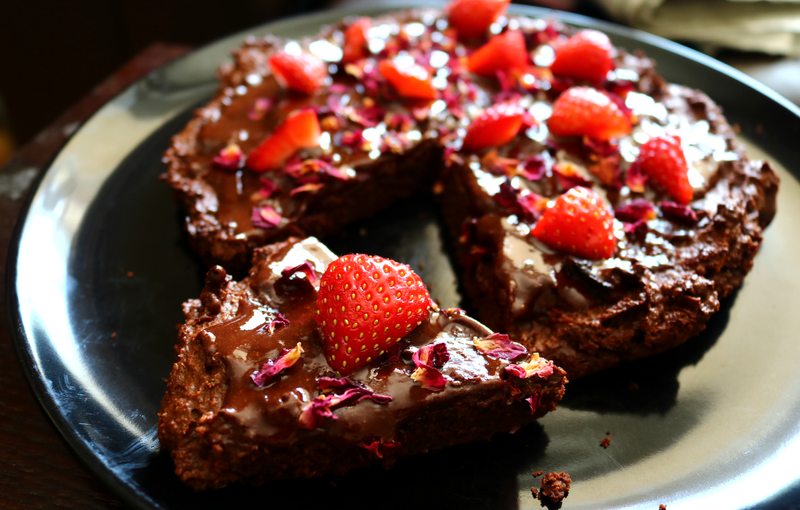 Not only are they packed full of healthy, plant-based recipes, but there are some seriously indulgent ones in there as well, so it made sense to have a browse when I was looking for something to satisfy my chocolate craving. I stumbled upon the following Chocolate Ganache Cake recipe from the Deliciously Ella Every Day book and I just knew that I had to make it! Luckily, I already had most of the ingredients at home as this cake is made from seven ingredients that I use on a regular basis, so it was mostly a case of simply blending everything together and popping it into the oven - super easy! This cake is incredibly rich and satisfying. It's wonderfully chocolatey and fudgey, and one small slice with a cup of tea is more than enough to put a smile back on my face after a long and busy week. 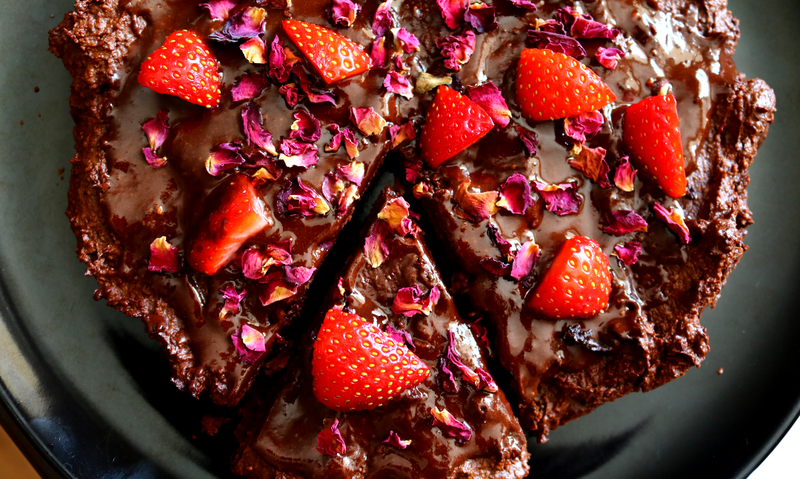 As it's Summer, I decided to add some fresh Strawberries and a sprinkling of edible Rose Petals over the top to finish it off (these work so well with the chocolate flavour too), so this would be a really beautiful cake to share with friends and family over the weekend. Preheat the oven to 180C and line a 20cm cake tin with baking parchment. Scoop out the Avocado flesh and discard the stones and skins. Add the Avocados to a food processor with all the other cake ingredients and blend until smooth. Gently scoop out the batter into the cake tin and smooth out the surface. Bake for 30 minutes or until a knife pressed into the centre comes out clean. Leave to cool and bind together for at least 20 minutes before turning it out of the tin. 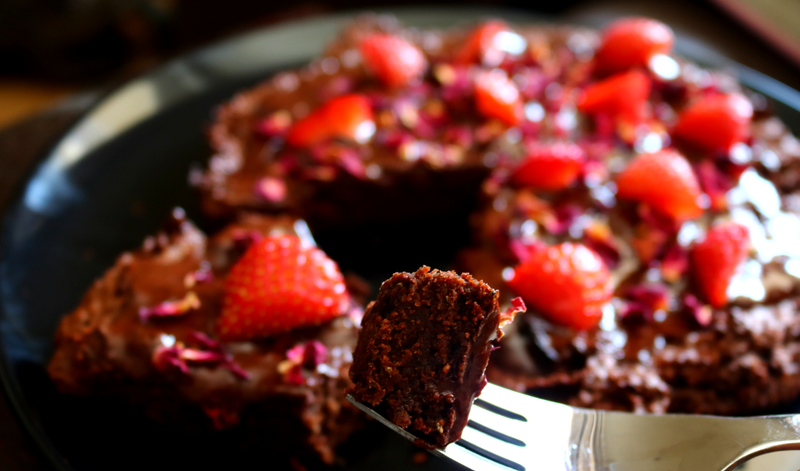 To make the frosting, warm the Coconut Oil in a saucepan over a low heat until it melts, and then stir in the rest of the frosting ingredients (minus the Strawberries & Rose Petals if using). Apply a generous layer of frosting all over the top of the cold cake and leave to set. 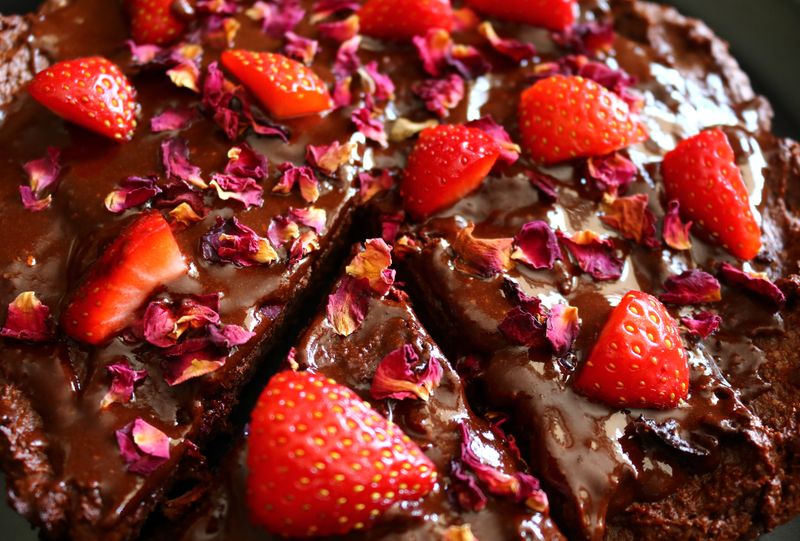 Add some chopped fresh Strawberries and sprinkle over a handful of edible Rose Petals to finish. Have you baked any cakes recently?